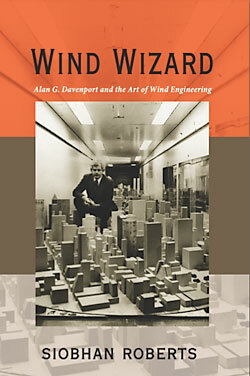 Wind Wizard tells the story of Alan Davenport, the father of modern wind engineering, who investigated how wind navigates the obstacle course of the earth’s natural and built environments—and how, when not properly heeded, wind causes buildings and bridges to teeter unduly, sway with abandon, and even collapse. In 1964, Davenport received a confidential telephone call from two engineers requesting tests on a pair of towers that promised to be the tallest in the world. His resulting wind studies on New York’s World Trade Center advanced the art and science of wind engineering with one pioneering innovation after another. Establishing the first dedicated “boundary layer” wind tunnel laboratory for civil engineering structures, Davenport enabled the study of the atmospheric region from the earth’s surface to three thousand feet, where the air churns with turbulent eddies, the average wind speed increasing with height. The boundary layer wind tunnel mimics these windy marbled striations in order to test models of buildings and bridges that inevitably face the wind when built. Over the years, Davenport’s revolutionary lab investigated and improved the wind-worthiness of the world’s greatest structures, including the Sears Tower, the John Hancock Tower, Shanghai’s World Financial Center, the CN Tower, the iconic Golden Gate Bridge, the Bronx-Whitestone Bridge, the Sunshine Skyway, and the proposed crossing for the Strait of Messina, linking Sicily with mainland Italy.